Payton, 54, has established himself as one of the NFL’s all-time great offensive minds during his 13-year run with the New Orleans Saints and quarterback Drew Brees. And the 32-year-old McVay has quickly joined him in two years with the Los Angeles Rams and QB Jared Goff, despite being the youngest head coach in the league’s modern history. “I think there’s some coaches that see things through the quarterback lens. 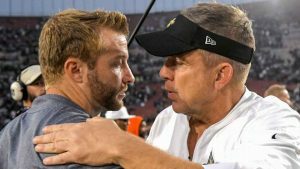 Sean Payton is certainly one of those guys … and McVay is certainly that guy,” said ESPN analyst Matt Hasselbeck, who is part of a Sunday NFL Countdown crew that is going on the road for just the third time in the program’s 33-year history to be in New Orleans for this marquee showdown. Hasselbeck, who played quarterback for another of the NFL’s all-time great offensive minds, Mike Holmgren, said there is something special about those playcalling coaches and quarterbacks who work in tandem like these two power couples. McVay and Goff have gotten a lot of attention over these past two seasons — justifiably, since they are leading the NFL with 30.9 points per game since the start of the 2017 season after the Rams ranked dead last in that category in 2016, before McVay arrived. In fact, Payton has been throwing all-new wrinkles into his offense this season with an expanding read-option package led by third-string quarterback Taysom Hill. Just last Sunday night at Minnesota, he had three quarterbacks on the field at once — with Brees and Teddy Bridgewater spread out wide as receivers. “Yeah, I think we like to feel over the last 13 years that we’ve kind of been at the forefront of the evolution of offensive football,” said Brees, who became the NFL’s all-time passing yardage leader last month. “Obviously with Sean and [offensive coordinator] Pete Carmichael and [quarterbacks coach] Joe Lombardi and others who have contributed to that. Kind of taking the personnel that you have and then being able to utilize it in some really unique ways.